PRAYER PROMPT ••• Isn’t this picture beautiful? It was taken near Asheville, NC, about three hours from where I live. I’ve visited about half of the US; have been to Canada, and parts of Europe; but no place is as beautiful to me as North Carolina. A first generation North Carolinian, I love my home state. But as spectacular as it is, it’s temporary. My forever home will be heaven because I have faith in Jesus. Hebrews 11 speaks of some early models of faith: Abel, Enoch, Noah, Abraham, and Sarah specifically. 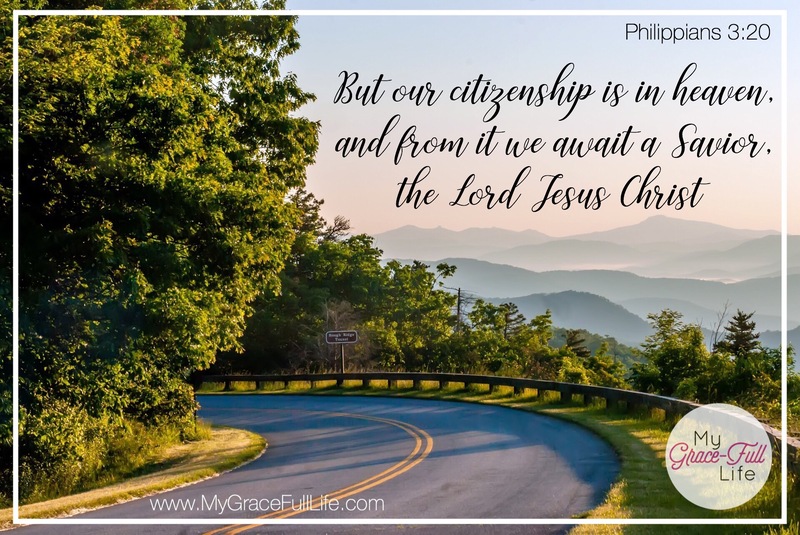 It’s a verse like this and the one from Philippians 3:20, (“But our citizenship is in heaven, and from it we await a Savior, the Lord Jesus Christ,”) that make me rejoice. Heaven is going to be more glorious than my wildest imagination. As proud as I am at the beauty of my home state – I can’t even put into words what it’s going to be like to call heaven home! I’m re-reading the Left Behind series. There’s some cross over to “Left Behind,” but it’s told from the perspective of those who were raptured. It describes some of the glories of the heaven. It’s a great book, and while fiction, I trust the authors who are both devoted Christian scholars, to present a setting that is rooted in Biblical prophecy. With all that said, if you’ve been reading for a while, you know my prayer is that God will wait for someone I love very much to make a decision, before sending Jesus to get us. The idea of them (and anyone!) being left behind terrifies me as much as the idea of being home in heaven thrills me. But it’s the thought of heaven that puts so much in perspective. It doesn’t matter who has what here. How big the house or bank account… how fancy the car. As a child of God, how do you think about heaven? Do you consider yourself a nomad here on earth? When you see things, do you see how temporary they are? Today, as you pray, thank Jesus for a home waiting on you in heaven. Pray that you will remember that everything about our life now is temporary. Ask Him to help you focus on what’s waiting for you, not what’s going on right now.